I have always loved cruise ships. I loved the idea of them long before I ever took my first cruise. 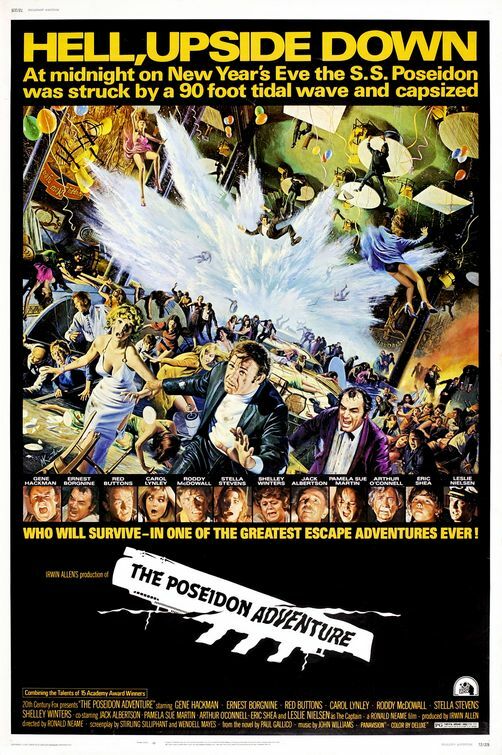 It all started, I think with THE POSEIDON ADVENTURE. Not one of the various remakes, but the original, with Shelly Winters, and Gene Hackman. I saw it when I was eleven. My father actually took me all the way into Manhattan to see it — which he never did. The advertisements billed it as “Hell upside down.” To me it was heaven. For an eleven-year-old, that crazy, campy movie was a life-changing experience. Oh, how I wanted to be in a big giant ship that turned upside down. I became obsessed with the movie, drawing pictures of the Poseidon in various stages of capsizing and sinking. I read the book by Paul Gallico. I even wrote him a letter, which he never responded to on account of he died. How inconsiderate of him. I secretly watched The Love Boat as a teenager. All I knew about Mexico was that Princess Cruises went to some mystical place called Puerto Vallarta. Now I own a time-share there. Then, in my adulthood I took my first honest-to-goodness real-life cruise in 1994. The Big Red Boat. My sons, Brendan and Jarrod were 5 and 2. I was, from that moment, hooked. Once a year after that we went on some cruise somewhere, always trying to find a different ship, experiencing the various cruise lines. I discovered that Carnival is great for kids and for people who like to party, however has the largest flesh-to-tattoo ratio I’ve ever seen. Celebrity is not for people with small, loud children. Princess has the best frozen drinks, Norwegian has the worst food, Holland America is for people who are already dead, and Royal Caribbean is generally best all around — people of all ages, great activities for kids and adults, and the coolest ships. In 1996, I received a brochure in the mail about the largest cruise ship in the world: The Carnival Destiny. 101,000 tons of Caribbean joy. My kids begged and begged that we go on it — and not just on any cruise, but it’s MAIDEN VOYAGE! Did we have the audacity to book the maiden voyage of the largest cruise ship in the world? The departure out of Miami was a city-wide party. Helicopters circled, news vans reported from the pier. Traffic was shut down as the Destiny left port. We had a floor to ceiling window in our cabin. I woke to the rising sun at least three mornings. Heaven. But where do you go in 1996 after you’ve done the maiden voyage of the largest ship in the world? Answer: You go see TITANIC the day that it opens. I will not tell you how many times I saw Titanic on the big screen. I’ll give you a hint: it was not quite as many times as I went to see the first STAR WARS, but a few more times than I went to see RAIDERS OF THE LOST ARK. Some people went for the romance. I went for the ship. Watching the Titanic sink on the big screen was like reliving my childhood viewing of the Poseidon Adventure. There are simply some childhood memories, some youthful indulgences we never do grow out of. For me it was the surrealistic nature of sinking luxury vessels. And then… Like magic… I made a REMARKABLE discovery! I had deadlines coming out of my ears, so I had rented a hotel room for a week as a writing retreat. It was a fairly cheap (in other words lousy) hotel, but I needed time away from home to focus on my work. Still, that rotten hotel cost way too much. …Then I happened to glance at the prices of cruises. Did you know that during the off season, you can take a seven day cruise for about $400 to Mexico, or anywhere in the Caribbean? $400! That’s half the price of that lousy hotel AND you get food… AND entertainment, AND a lounge chair, AND a 360 degree view of the ocean that changes every day! I cancelled the hotel, and went on a cruise instead. I was amazed at how much writing I got done! Since then I book about four floating writing retreats a year. I only book trips to places I’ve already been, so I don’t get tempted to get off the ship and explore. I’m there to write. I write 12 to 15 hours a day, then I work out — which I do more on ships then I do at home — then I eat, and then the gentle motion of the ocean rocks me to sleep. I still take my family on cruises. Sometimes It’s just me and the kids. Sometimes I bring my parents along. Sometimes it’s just me and my girlfriend, Chris. In fact, I’m writing this on a cruise right now (but I’ll get to that later). People think cruises are for old people, and although there are always quite a few retirees on the ships, somehow cruises keep me young. They feed me — and I’m not just talking about the buffets. I believe that there is something wonderful about a group of strangers taking a communal journey. And how cool if it sinks. You are currently browsing the Neal Shusterman's Blog blog archives for January, 2010.